WASHINGTON — China, one of the world’s largest markets for elephant ivory, will close out 2017 by shutting down its domestic ivory trade in an effort to curb poaching and ensure a future for the imperiled species. A ban on all ivory sales kicked in Sunday, a year after China announced a four-step plan to end its legal market. The Convention on International Trade in Endangered Species of Wild Fauna and Flora, or CITES, an international treaty to prevent animal trafficking and species extinction, celebrated the new law taking effect in a post to Twitter. Conservation groups estimate that some 30,000 African elephants are killed by poachers each year; their tusks carved into trinkets, chopsticks, jewelry and other items purchased by some Chinese consumers. They say China’s legal market has allowed for an illegal one to also thrive. In a January 2016 report, National Geographic estimated that China’s legal ivory stockpile to be around 40 metric tons, while its illegal stocks were around 25 times larger. Since its announcement late last year, China has seen an 80 percent drop in the amount of ivory being seized at the border and a 65 percent decline in raw ivory prices, according to WildAid. 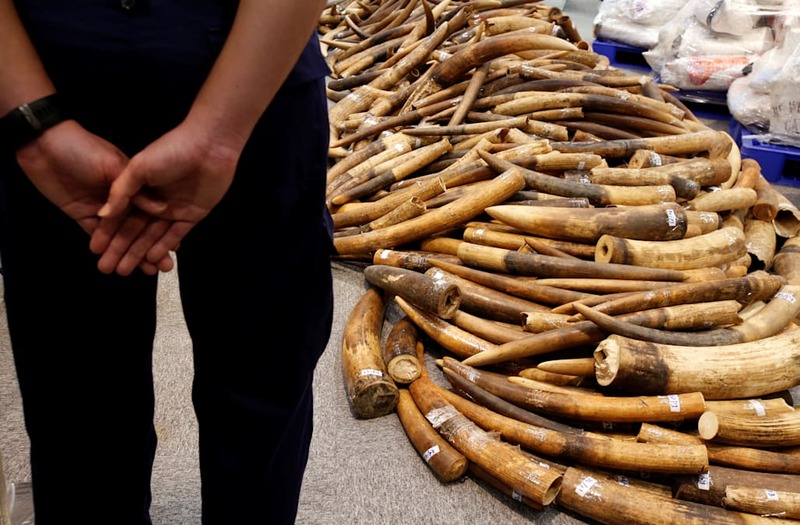 The ban will result in more than 170 ivory-carving factories and retail outlets being closed. The ban does not apply to the Chinese territory Hong Kong, an ivory hub that is also considering a sales ban. Local government officials there are expected to vote on the matter early next year. Former NBA star Yao Ming is among the celebrity figures that has joined the campaign to raise awareness about the impacts China’s legal ivory trade has had on elephant populations. The United States enacted a near-total ban on the sale of ivory in July 2016. But a recent move by the Trump administration has conservationists seeing red. But as quick as the agency could announce its official decision, Trump stepped in to suspended it. In a Nov. 19 post to Twitter, he called trophy hunting a “horror show” and said he’s unlikely to allow for such imports. And he said he would make a final decision on the matter the following week. More than a month later, an announcement has yet to be made. African elephants have been listed as threatened under the Endangered Species Act since 1978. A provision of the law, however, allows for sport-hunted trophies to be imported if the government determines that hunting will help safeguard the population.